What is the Celebrity Juice Diet? It is 2 day program that cleanse and prepares your body for dieting. The programs suggest that you fast for 2 days and don't smoke. The diet appears similar to a liver cleansing diet but it more of a crash diet way. This product is available at GNC and other good health stores for around 19.99$. 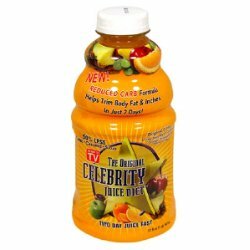 With your help we can reach more people and let them know about The Celebrity Juice Diet whether this product works or not.